This is an archived version of a previously issued pickleball newsletter. The most current N. Phoenix Newsletter is available by clicking HERE! I have been asked to circulate the message below for those who would like to work in City of Phoenix facilities coaching, selling or teaching. If you don’t have any interest in these opportunities feel free to skip to the next section. The following information is for becoming a vendor with the City of Phoenix to provide classes or supplies with the Parks and Recreation Department. Currently the City’s process requires potential vendors to register with the City using a two-step process. Step one, which can be done immediately, enables you to acquire your official City of Phoenix vendor number and be placed on a Qualified Vendor notification list. You will be notified by e-mail when to complete Step two. This process will require you to submit your qualifications with the Parks and Recreation Department to be eligible for the Qualified Vendor List (QVL). This second “QVL” process is only opened twice a year, in late fall and mid spring and again, you will be sent an e-mail notifying you that the list is open. Please click the attached link for further information. NOTE – This effort is not a part of, or endorsed or sponsored by the City of Phoenix/Parks and Recreation Department. This is an independent attempt to facilitate pickleball play at Sunnyslope CC. In an effort to support and facilitate pickleball at Sunnyslope as other venues are becoming more crowded, I have created a SignUp Genius page. By using SignUp Genius to indicate that you will be playing at Sunnyslope on a particular day, others will know if there will be enough attendees to have a robust and enjoyable day of pickleball. For those interested in playing at Sunnyslope CC, you can get started by scrolling down to the calendar at the link above and click on a date. Enter your information including your email and click Submit and Sign Up. YOU DON’T NEED TO HAVE AN ACCOUNT although it is handy. If you run into difficulty, I will try to assist for the first few weeks until the system becomes familiar to those using it – email me. PS – Low attendance is good for more court time for beginners, those who want extended practice or teaching! In my effort to purchase replacement Onix Pure 2 Orange Indoor Pickleballs for use at Paradaise Valley CC, I learned that these pickleballs are being discontinued. Many people enjoyed playing with this particular ball because it had a nice bounce, responded well to the paddle and it was very durable. If you enjoy the Onix Pure 2 and would like to prolong the inevitable you can try to purchase some while supplies last. There will continue to be a Pure 2 pickleball, but it is designed for outdoor use. 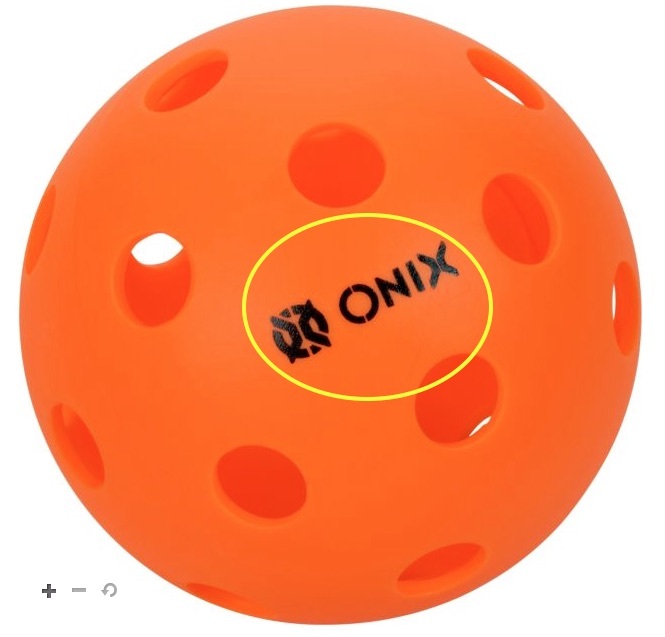 Onix is producing a new version of the Orange indoor pickleball which is called the “Fuse.” It is my understanding that the Fuse will also be manufactured in yellow. Communications with other PB ambassadors indicate that the new Fuse does react a bit differently during play, but is very similar. One drawback has been that the ball does not hold up to play as long as the Pure 2 did. Notice that the Fuse does not have a dark imprint of the word ONIX (as of this date) and the FUSE will have USAPA Approved in black ink. There were a number of players who were at PVCC on 10/31 and they were in the Halloween Spirit. 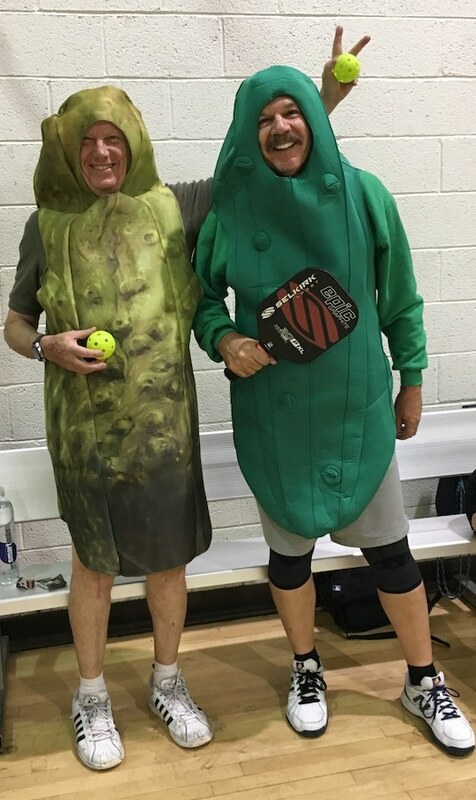 Can you tell which one of these Pickle-ball-players was the dill pickle and which one was the sweet pickle? She challenges us to do more than just try to get the ball back over the net, and to return it to a player or place on the court to support a strategy. If this is currently beyond your skill level or interest, don’t worry. It is still an interesting read and offers something to which we can all aspire. You can read MAKE THESE PICKLEBALL DECISIONS BEFORE EVERY POINT by clicking the link/title. PS – Even during non-competitive club play, it is a positive thing to have a plan before the ball comes at you! Stay well and I hope to see you on the courts!